We have almost as many different situations to kibitz (watch) as we have areas on Bridge Base Online (BBO). As you get more comfortable with the BBO interface, you will find your favorite tables to watch. 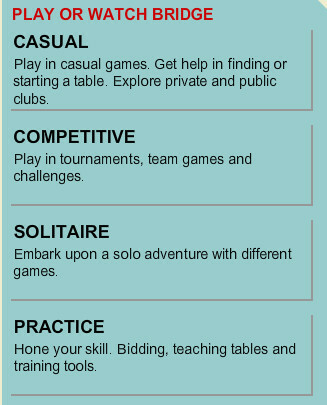 Players kibitz for various reasons from just passing time, to making the session a learning experience. Teachers can kibitz students and students can kibitz teachers. Some like to kibitz potential partners to see if they would be compatible while others wonder why they were soundly trounced by a pair and want to see how the pair does against someone else. Whatever may be your particular reason for kibitzing, it's an enjoyable and permanent feature of bridge and used by almost all players from the raw beginner to the highest level World Class player. So let's get started with some different ways to find a fun table to kibitz. Under the heading Play or Watch Bridge, click the link Help me find a game. You can click on Take me to an interesting table found under the section Watch Bridge and let us decide which we think you'd like to watch. Clicking this option will typically take you immediately to a table with "Star" players as those tables tend to attract the most kibitzers. But you may want to make your own choice from the tables we have declared interesting, in which case you will click on the line List interesting tables. You will now be shown a list of tables that will most likely contain Star players or players with a high BBO points rating, and you can decide for yourself which one looks like the most fun to watch. These games are sorted by the number of kibitzers already watching a table. To view other kibitzers at the table after you've joined click on Who's Online on the far right, top horizontal row of tabs, and then click the Kibitzers tab on the far right. The list of others enjoying the same table with you will appear on the right hand side of the screen in alphabetical order. Suppose, though, that you're not really interested in watching high level players, but instead just want to join a table with regular players. Under the heading Play or Watch Bridge, click on the line List all tables. 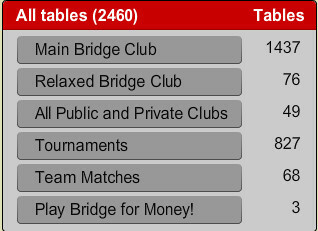 You can now choose from several options including tables in the two clubs, the Main Bridge Club or the Relaxed Bridge Club, all clubs both public and private, all tournaments and all team matches. Play Bridge for Money is on this list but kibitzing isn't allowed in our Money games. For example, click the Main Bridge Club link. This will be a much larger list. And here you will see all tables in the club, listed alphabetically by table host name. Some tables may have a 'lock' on them. This means that although you are allowed to ask to join, you must have permission from the table host. Clicking on Join in this instance will send a message to the host of the table that you want to kibitz and he can accept or reject the request. You may also see a slashed circle under the Kibitzers column. This universal symbol for 'stay out' means the same thing here. Kibitzers are not allowed. Of course, if neither a lock or a slashed circle is shown, then kibitzers are welcome and you can watch by clicking on the Join button under that heading. 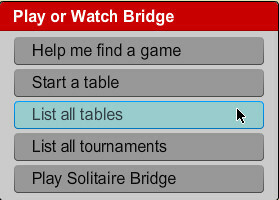 Under the heading Play or Watch Bridge, click on the line List all tables. Choose Tournaments. Then you want to choose the Running option from the list. By clicking on Tables from the selected tournament you will be taken to the game area and will find if you can kibitz. Many of our BBO masterpoints tournaments do not allow kibitzers except perhaps for the last round. A red circle with a line through it means kibitzing is not allowed. Click the Back button to return to the list of tournaments. You may decide to kibitz a Team Match and will click on Team Matches from the List all tables heading. From the Team Match heading you will click on the Running tab. You will only be shown those team matches where kibitzers are allowed. This screen shows you the Host of the match, number of boards, and total number of kibitzers. The Join button shows you how many kibitzers are watching an individual table. Click the Join button to begin kibitzing.